Oil Cleansing Method for your Face! Candles – Are Yours Toxic or Non Toxic? Chances are the scents in these candles are artificial and toxic as well! 😢 Synthetic scents are so bad that they’re even being called the new second-hand smoke. This is no surprise given that about 95 percent of chemicals used in synthetic fragrances are derived from petroleum (crude oil). These include things like benzene derivatives (carcinogenic), aldehydes, toluene, and many other toxic chemicals linked to cancer, birth defects, central nervous system disorders and allergic reactions. Get the research here! I know TOO MANY people that burn regular candles in their house and have no clue what toxins they are putting into the air. The smell should be relaxing and mood uplifting but if it is filling your home and body with toxic chemicals, where is the relaxation in that? Even among conventional candles, there are some that are better (or worse) than others. Here are some tips for what to look for and what to avoid. Cheap “aromatherapy” candles, from brands like Febreeze and Glade. There is actually nothing therapeutic about the scents in these are actually very harmful. Non Toxic Candles – How to find them? Wax – It’s better to choose clean-burning soy wax or beeswax, but be sure to look for 100 percent on the labels, and, when possible, select wax that is naturally derived or sustainably sourced. Many are a blend of paraffin and another wax but will call it “beeswax”, so read your labels or reach out to the brand if you’re not sure. I personally choose to make mine with beeswax as most of the soy grown in North America is GMO and I don’t like supporting those farms! Scent – Stay away from anything that says Fragrance as it is a hiding spot for toxic chemicals (both in candles and skincare)! Go for products that specify they’ve used 100 percent naturally derived essential oils, phthalate-free, or further explain the “fragrance” to be natural and nontoxic. I hope that you have a better understanding of why you should get rid of all of your paraffin candles, RIGHT NOW, and that you will share what you have learned with everyone you know! It is our job to reduce toxins in the world so our children can truly live a toxic free life! Have a great day and let me know what you decided to do! « Previous Post Whole 30 Clean Eating Journey with no sugar! Next Post » Bentonite Clay – 5 Reasons To Put It On Your Skin! 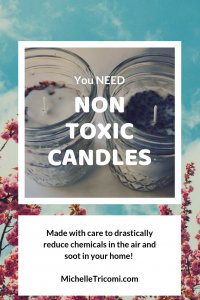 2 replies to "Candles – Are Yours Toxic or Non Toxic?" Great post on the dangers of using commercial candles! Thanks for the information Michelle! ©2018 Michelle Tricomi. All Rights Reserved.